The CrossOver X15 iButton Lock is designed to secure indoor closets and cabinets. 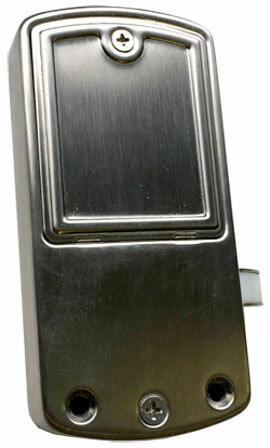 It is operated by iButtons or the keypad, and uses the same AccessPilot software as the CrossOver X25 and CrossOver X45. Click here for more on the software. Keypad: 12-key weather-resistant numeric keypad. Keypad Functions: Permanent codes, temporary codes, one-time service codes. Power Supply Life Expectancy: 10,000 operations, low battery warning when system drops below 4.8 volts. Memory Retention: Flash memory never loses memory even without power (except current time and date). Programming/Communication Method: iButton keyfob, no annoying wires. Master Key: iButton used as master key overriding the keypad code. For emergency opening, a power pack is required and comes with the Lock Management Kit (see below). Functions: Timed lock functions (automatically lock or unlock), fully programmable exception dates (holidays), temporary dates and time restrictions for keypad code users and iButton keyfobs. 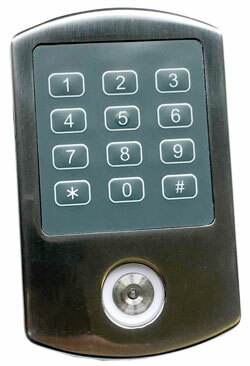 Size: Front (keypad side): 4" x 2½" x ¾"; back: 5¼" x 2½" x ¼"
Audit Trail: 3,000-event audit trail. Users: 299, can be a mix of keypad codes and iButton key-fobs. Anti-tamper: Red-warning light stays on for 60 seconds after 3 consecutive invalid code entries. Accessibility Standard: Meets ADA standards (Americans with Disabilities Act). Lock Back Time: 1 to 25 seconds (default is 5 seconds). For a brochure with more details about CrossOver locks, as well as the X15 Quick Start Guide, software manual and installation instructions, please visit our Support Center. The Lock Management Kit, which includes software and other items needed to program the lock. Only one kit is needed, no matter how many CrossOver Locks you have. The Lock Management Kit for this product comes with an external power pack that can be used to power the lock in emergencies.